Q 1. What is food poisoning? Ans. Food poisoning is caused when you eat food contaminated with pathogenic (unwanted!) microogranisms such as bacteria, viruses and parasites. Such pathogens are everywhere-in the air, soil, water, and in human and animal digestive tracts. Most are capable of growing undetected in food because they do not produce an "off" odor, color, or texture. The only way these microbes can be prevented from causing human illness is by handling and storing food safely. The most common symptoms of food poisoning include stomach cramps, nausea, vomiting, diarrhea and fever. Bacteria are a common cause of food poisoning. Bacteria live naturally in the environment (air, water and soil) and inside people, animals and birds. They become a danger when their numbers grow in food before it is eaten by people. Bacteria grow best in warm temperatures (between 35°C and 37°C), which is around normal human body temperature, but will grow between 5°C and 60°C. Food that is left out of the refrigerator for too long is a real risk, especially meat (eg. raw or cooked beef, chicken, fish, pork), dairy products (eg. milk, soft cheese, custard, cream), egg products (eg. Mousse) and some cereal-based products (eg. cooked rice, cooked pasta). Viruses and parasites are commonly associated with contaminated water and raw produce. Q 2. How to prevent food poisoning? Wash your hands before handling food and often during food preparation. Wash and sanitize all surfaces and equipment used for food preparation. Protect kitchen areas and food from insects, pests and other animals. While most microorganisms do not cause disease, dangerous microorganisms are widely found in soil, water, animals and people. These microorganisms are carried on hands, wiping cloths and utensils, especially cutting boards and the slightest contact can transfer them to food and cause foodborne diseases. Separate raw meat, poultry and seafood from other foods. Use separate equipment and utensils such as knives and cut ting boards for handling raw foods. Store food in containers to avoid contact. Raw food, especially meat, poultry and seafood, and their juices, can contain dangerous microorganisms which may be transferred onto other foods during food preparation and storage. Cook food thoroughly, especially meat, poultry, eggs and seafood. Bring foods like soups and stews to boiling to make sure that they have reached 70°C. For meat and poultry, make sure that juices are clear, not pink. Ideally, use a thermometer. Proper cooking kills almost all dangerous microorganisms. Studies have shown that cooking food to a temperature of 70°C can help ensure it is safe for consumption. Foods that require special attention include minced meats, rolled roasts, large joints of meat and whole poultry. Do not leave cooked food and salads at room temperature for more than 2 hours. Keep cooked food piping hot (more than 60°C) prior to serving. Do not store food too long even in the refrigerator. Do not thaw frozen food at room temperature. Microorganisms can multiply very quickly if food is stored at room temperature. By holding at temperatures Below 5°C or above 60°C, the growth of microorganisms is slowed down or stopped. Some dangerous microorganisms still grow below 5°C. Raw materials, including water and ice, may be contaminated with dangerous microorganisms and chemicals. Toxic chemicals may be formed in damaged and mouldy foods. Care in selection of raw materials and simple measures such as washing and peeling may reduce the risk. Q 3. Food Complaints - What to do if you suspect a problem with food products? Ans. 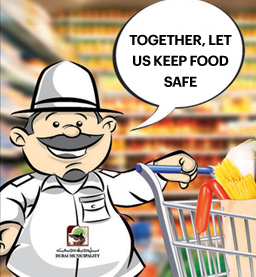 In Dubai, investigation of food complaints is undertaken by the Food Control Department of Dubai Municipality. Thankfully problems like this are relatively uncommon but when they do occur Dubai has a food recall system in place to deal with them. Recalls are also made when similar products are affected in a different country and the implicated products or products from that batch have been imported to Dubai. You may take photographs and send it to us if possible. Do not forget to request for a stool culture test because that will help us in identifying the agent that caused the illness. This is important for further investigation and source identification. Remember that many food poisoning bugs take a while to take effect. Often the last meal may not be the culprit, as food poisoning symptoms in most cases appear after many hours and sometimes days in the case of infections. The Food Control Department will ask you the meal history for at least five days preceding the onset of illness in the case of foodborne infections.